Do the people that matter know what you do? If perception is reality, how do prospects or even clients perceive your business? There are a number of pieces of research that indicate that much of the buying process has taken place before organisations contact a vendor, research by Forrester put this figure at between 50-90%! If this is the case, how do prospects truly understand your capabilities and what makes you different from any other potential vendor? From my own personal experience over the 20+ years I’ve been in business development, I have lost count of the number of times I have met with prospects (and occasionally existing clients!) and they have said to me “I didn’t know your company did that”. 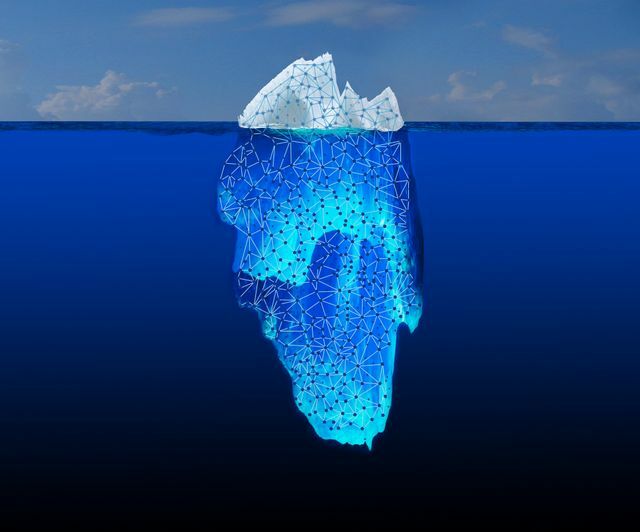 It’s not surprising when you’re selling complex and often enterprise-wide solutions to multiple stakeholders, that someone looking from the outside cannot understand every potential problem you can answer. So how do you make inroads into changing that? 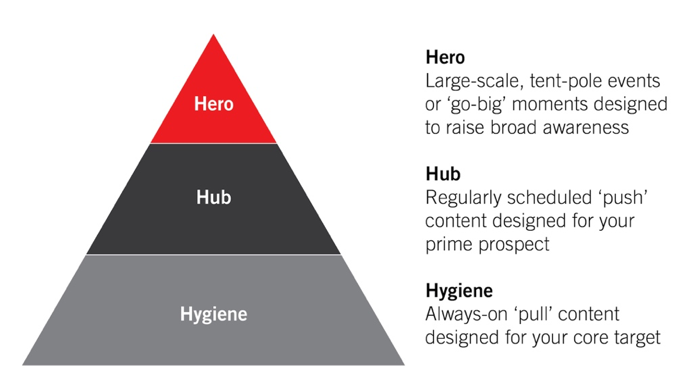 Below is a diagram of the well-known Hero, Hub and Hygiene content strategy pyramid developed by Google. Almost every organisation is great at the Hero content. This is the large-scale content that often encapsulates the much broader proposition of any business, but how many people actually read the 10-100 pages often making up this content? Especially when they are assessing multiple vendors and they have a very specific need state and they are reading your potentially generic content for that vertical. Equally, most organisations are great at the Hygiene content. Ostensibly this is your website and download pages. If we are all honest, after looking at our own websites, you will admit that by navigating around and putting yourself in the shoes of your prospect, there is always something you wish was front and centre based on your own role or the solution you would like the prospect to see. There are some great reverse IP lookup solutions that will display content from your website that “should” reflect your offering to the type of organisation landing on your website. But does this go far enough to meet their specific need or show that you have much wider capabilities? 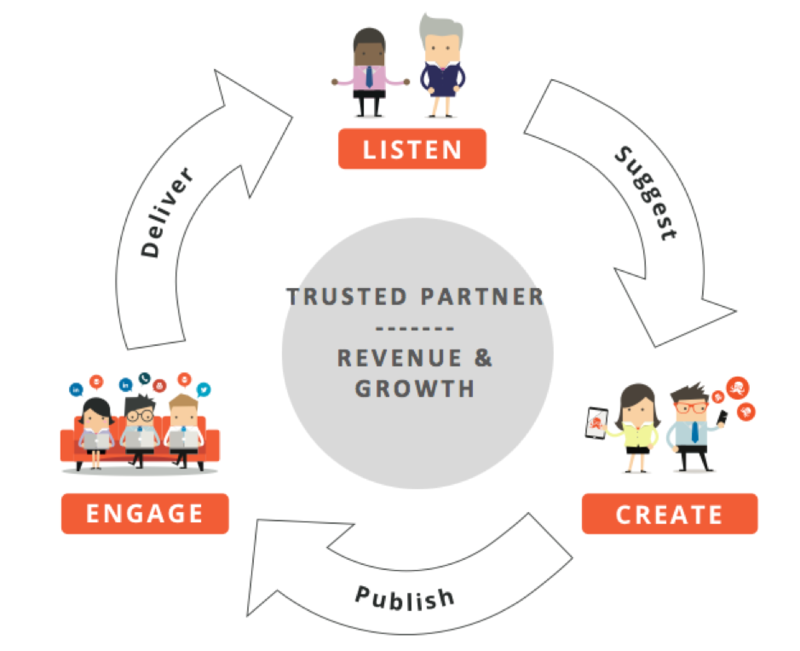 At Passle we believe the most important part of the content pyramid is the Hub. Where your Hero and Hygiene content is the equivalent of a container ship, the Hub content allows you to be a speedboat! 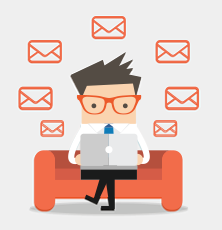 By getting your subject matter experts, sales teams, client facing colleagues and marketing to collaborate and produce regular, timely and on the pulse content, you can evidence so much more of your capabilities. Joint research by Edelman and LinkedIn suggested that content shouldn’t be exhaustive, it needs to be pithy and no more than 200-300 words. Getting to the detail quickly, providing an opinion and evidencing your expertise. If you have 5 minutes, it is worth a read. In the research article, Joe Kingsbury (U.S. managing director, B2B, at Edelman) explains that thought leadership is a "Double-Edged Sword" and that if it is not high quality, insightful and relevant it can have a negative impact on the business. This is why it is essential that thought-leadership has to come from the heads of the true experts in your business. The people who live and breathe that subject matter, the people who are reading about and deciphering news in their industry every day and those who know what is actually relevant and indeed useful to their clients and prospects. This needs to then be amplified by your sales or client facing teams using the content to get in front of your prospects and controlling their perception of your organisation.